I don't love clothes. I don't love to shop for clothes. I don't love to piece together outfits. Now shirts? Shirts, I'm good at. I try on many, and usually hate them all. So when I heard of Stitch Fix (I think I stumbled across it on Pinterest), I was really excited. A stylist takes your "case" and researches your style (including the Pinterest board you provide) and then the stylist MAILS YOU CLOTHES SHE PICKED FOR YOU. I thought, surely, this will never work. Surely, this will be a waste of time, energy, and $20. Then a small voice in the back of my head (the voice who hates dressing rooms and malls and digging through clearance racks) whispered, "But what if it works?" This one was not a stretch. I totally would have picked this up on my own. First of all, it's gray, my favorite clothing color, and secondly, the zippers on the shoulders are a little rock n' roll. The neck was another favorite element--love the scoop! These pants. I was positive anything with a tag that read "super skinny" was a "no" for this girl. I have hips. I have a backside. Those two elements alone make jean shopping a NIGHTMARE. But these? They feel like pajamas! So comfy, really flattering, and a natural fit with the gray shirt. Love the color but the fit was "eh" in my opinion. Though, I must say, paired with a summery skirt or shorts, I think this one will work just fine. Plus it's out of my comfort zone, so I decided to keep it. Things Jessica doesn't need help shopping for: accessories. That said, this feather necklace was the perfect length and accessory for the pieces chosen, and since I receive a "buy all 5" discount, and everything else worked, keeping it was a no-brainer. This was so hard to photograph! But I tried... Navy blue with black on the shoulders, this short-sleeved dress was a great cut with a flared skirt. My stylist (snicker!) suggested I wear it to book signings, so this one will be making an appearance at RAGT this year. 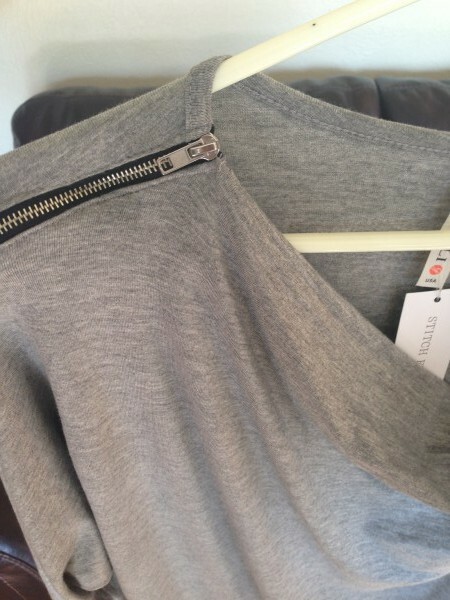 So, there's my Stitch Fix success story! I seriously can't recommend this experience enough! I ran straight to my author/clothes-horse friends (Lauren Layne & Maisey Yates & Shannon Richard) to show them pictures. They all agreed the outfits were on par. I have no idea if I got really lucky, or if Stitch Fix is just really good, but nevertheless, I promise you, I'll try this again. Here's a referral link if you want to check it out: CLICK HERE.